This is a picture I've always wanted, ever since I started blogging. It's a picture of me with Fat Cyclist, aka Fatty, aka Elden Nelson. Back when he was still on MSN Spaces and I was mulling an entry into an impossible-seeming race called the Susitna 100, he sent me a Banjo Brothers seatpost bag as a prize for writing what is possibly the only funny thing I've ever written - an essay on bungee cords. Now look where we are. He's helping raise hundreds of thousands of dollars to fight cancer and I'm ... in Utah. It made sense that we meet up to go for a ride. He invited his friends, Dug and Brad. 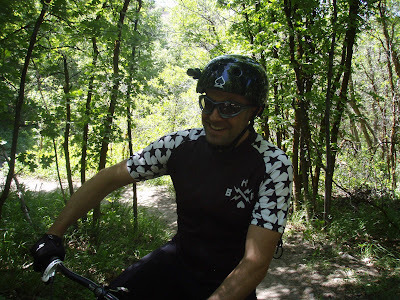 I tried to warn them all that I am a flailing klutz, a timid one at that, on a mountain bike. I have stamina but no skills. "Think of your 6-year-old niece and take me where you'd take her," I told them. Maybe I forgot to tell them that. Either way, I showed up with my Karate Monkey, which is currently having front brake problems, and Elden offered to let me borrow his Gary Fisher Superfly - a full-carbon rigid singlespeed superbike. I picked it up and it weighed less than my Camelbak. On top of that, Elden offered to let me borrow his brand new Specialized bike shoes to go with the clipless pedals attached to the Superfly. The only problem - I've never ridden a singlespeed; I can't ride clipless to save my life. And, oh yeah, I have a 6-year-old's skills on singletrack. No matter. I was too busy drooling to notice. I only fell twice on the climb, mostly because my trained-for-distance-but-not-power legs stalled out on some of the steeper pitches and I couldn't get out of the clipless pedals, so down I went. Elden was being amazingly patient about how ridiculous I must have looked. But I could feel the shame burning through ... "I thought you were that chick that rode the Iditarod. What's wrong with you?" But the fear took over by the time we reached the top of Jacob's Ladder, and from there I didn't care how silly I looked. I was going to ride the brakes, keep my right foot free from the pedal and get down alive. I still took one fall on a boulder near the bottom. I felt horrible about crashing the Superfly. I think I would have preferred to break an ankle over breaking that one-of-a-kind frame, which was light enough to be made out of Styrofoam and looked like it would bend if you flicked it with your finger. But, luckily, all looked well. If that bike can hold up to my lack of mad skillz, it can probably handle anything. 1. He's just as nice in person as he is on his blog. 2. He'll make fun of you if you deserve it, but it always comes out in a friendly way that lets you laugh at yourself. 3. He gives away free stuff in real life just like he does on his blog. After my rather disastrous clipless run, I mentioned I was thinking about clipless pedals for the Great Divide. He offered to let me borrow a pair of his shoes (a size too large, perfect for my frostbitten toes) and see how they work out for me. Also, Brad brought me a bag full of CarboRocket drink mix. I haven't had a chance to try it yet, but I plan to take it with me this weekend to the hot, hot desert, and I'll report back. 4. He's not lying about the quality of the Corner Canyon trails. The amount of singletrack really is amazing in its awesomeness as well as its proximity to the city. 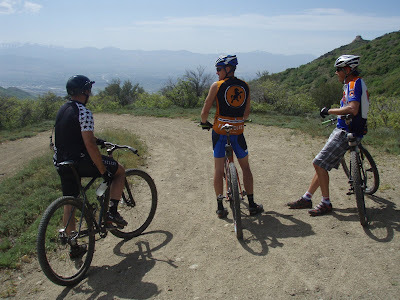 His friends helped build several of those trails. 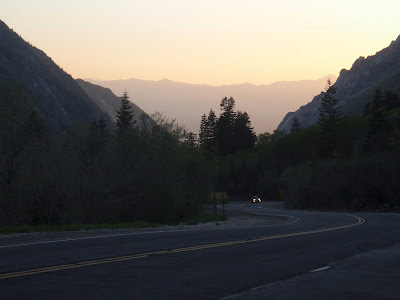 I finished out the day with a jaunt up Little Cottonwood Canyon and descended at sunset. Tomorrow I head to St. George to get some work done on my bike, visit a couple of friends,visit my grandpa and just enjoy a few days in the Land of Zion. I'm expecting more heat and sun, which feels a little less horrible every day. Yay!!! I love that you and Fatty met up! And I agree with #5 - he is so not fat. I still owe you some comments about your book, Jill, but wanted top pop in and say hi. Glad the heat and sun are suiting you reasonably well. I have to say that I really wish I was a lot more like you. You take such good care of yourself and are always on adventures. Enjoy biking! I think for next Christmas the whole family is getting new bikes! Bloggers of the world unite! Sounds like a great ride. Enjoy the desert! I was pretty psyched when I saw the picture with you and Elden at the top of this post- kind of like a bike blogger equivalent of a Reeses Peanut Butter cup! Now I can't wait to get his perspective and video. I seriously thought it was you and another girl in that photo, until I saw the facial stubble on Elden. He's got arms like a girl !. Looks like he needs to spend some time at the gym doing some upper body workouts. It's great that you got to ride with Elden. Man, that is super cool. I can't believe you rode a single speed. I've read Dug's blog for a while. Did he talk about bathrooms on the ride? That seems to always be on his mind. That pic made me smile too. I was turned on to his blog thru yours or yours thru his....been to long to remember... but sure am glad I found you both! Carbo Rocket will be one of the best discoveries you will make. If you need any tips on using or even mixing the stuff let me know. I can ride for days on just CR and p-chips. Enjoy :) ... I am so jealous of the ride! And the SuperFly ... geesh! How cool! I'm seriously jealous...would love to ride with those guys though I'd be so nervous. Love the photo! Jill, it was nice to meet you. You are much taller in person. I can't believe we dragged you up to and then down Jacob's for your maiden voyage on both clipless pedals and SS. It was all Elden's fault. I can't think of any one that would have made that round trip under those circumstances with a smile on their face. I expected nothing less from you and you delivered. BTW, the SS Superfly looks way better on you than Elden. I'll talk to him. epic post and video on FC! I want to read the essay on bungee cords! It looks like the Superfly has a freewheel. That was a relief. Glad you guys met up. Jill: You rock harder than Pantera. Thanks for the inspiration, and looking forward to reading your book! Yeah, Catwoman and the Hulk in the same panel! what a FUN banter session between you and Fatcyclist. i am really enjoying reading both of your blogs. keep up the good work! And nice posting the last few weeks...you are living the dream, thanks for taking us along! I really, really like this Jill. I am glad you are having a good time down there. I love to get out that way every chance I get. There is just so much to do.